This is a subtle but important error that most of corporate America commits, on a regular basis. Nothing longer than the end of the next quarter matters to the average accountant in a large corporation (which gets back to my previous observation about large corporations and innovation) I have watched this particular progression occur over and over in the corporate world, as the accountants convince the managers that their distorted view of the bottom line is the only view that counts. …and then the finger pointing concerning who’s to blame for the company loosing market share begins. Are we not clever enough to withstand Apple’s spin? Steve Jobs has a mind control ray? It would explain a great many things. Today’s papers are full of the announcements, all buying into Jobs’ “seven wonders of the world” line about the new touchscreen iPod. There’s no doubt it looks great but DO YOU REALLY NEED IT! And yes, I know you can say that about all technology but it’s a serious point where iPods are concerned. Apple feeds off the hype that follows its announcements and I am surprised they still get away with it. I mean how often do you change your washing machine? Or you oven? Or your TV? Or your digital camera? We buy those expecting them to last years but far too many people seem happy to splash out a couple of hundred quid or more on an iPod only to “trade up” six months later when Steve appears on a big screen presumably sending out some sort of psychic wave. I can’t think of any other explanation for the cultish behaviour that sees millions seemingly brainwashed into replacing a product that’s perfectly good for one that doesn’t really do anything different to what they hold in their hands. I’ve never owned an iPod. Even though my first exposure to computers was on a Mac (the original) I’ve never had the need to own any of Steve Job’s new gizmo’s. 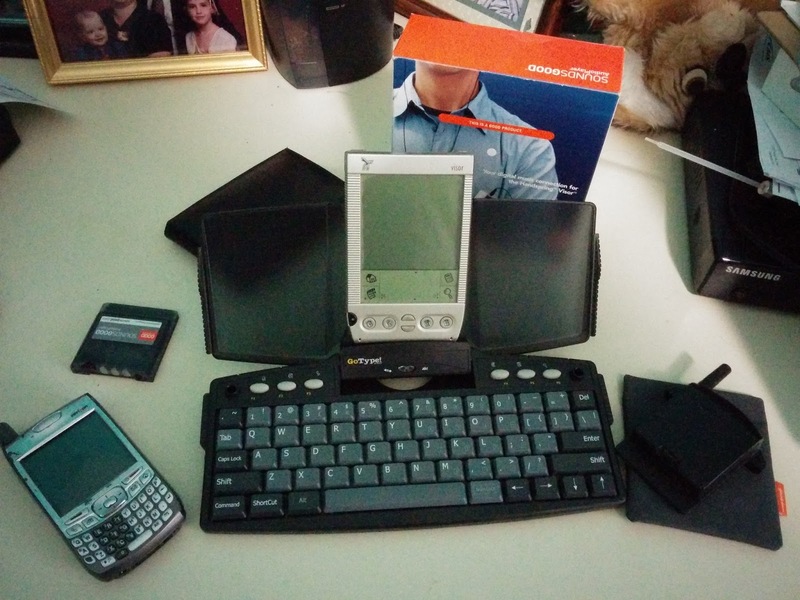 I’ve carried a Palm device since Handspring was formed; years before Jobs had his vision of the iPod. The first add-on I bought was a 64 meg MP3 player, which I used for several years as my only MP3 player. I’ve currently got a Treo 650 (which is two iterations behind the latest and greatest Palm device) and I have no need to upgrade to a newer Palm, much less a use restricted MP3 player that doesn’t include a phone. When I first decided to invest in Palm devices, I did so based on the concept of one device that performs the functions of several devices I might need to carry; phone, camera, data, music and video. The first Handspring with add-ons could live up to this expectation. The current Treo does it with nothing more than an SD card for additional memory. The iPod is just a walkman that plays MP3s, and now it plays video. Nothing new there. The iPhone is just another cell phone with a really cool interface. Also nothing new. Palm was the innovator of handheld devices, Apple is just the copycat. They lost their cutting edge when they lost the Woz. I don’t know who the next innovator will be, but it won’t be Apple. Perhaps Google has something up thier sleeve? Ever heard of Archos? Who knows what the future holds; history, however, has shown that giant corporations do not produce innovations. Author ranthonysteelePosted on September 7, 2007 Categories Humor, TechnicalTags iPhone, PalmLeave a comment on Are we not clever enough to withstand Apple’s spin? The Cave… Again; or, God is a couchpotato geek. I’m a Matrix fan; or more accurately let me say I was; if the current re-hash of worn-out philosophical concepts keeps resurfacing I might not be anymore. A good friend forwarded me a link to yet another philosopher, with yet another theory concerning the unknowability of the realness of life the other day, possibly because he knew of my fondness for the Matrix. There might have been another reason, but frankly I would prefer to think it was because of that. The link was to a NY Times article, but for those of you who don’t have a log-in for NYT, you might try this link instead. I find most of these hypotheses so laughable it’s hard to even summon the willpower to counter them; but I think I’ll try, just this once, to summon the requisite energy and present the case that is quite obvious to me. Always, always, always those philosophers who want to convince us that we cannot control our world or even our own lives will invent some way to explain away the helplessness that we all supposedly feel when faced with cold hard truth. Invariably they will offer up some variation on The Cave (a favorite amongst SF writers) and pretend that none of us can turn around to see the world that really exists; that we cannot know reality. In this particular instance, Mr. Bostrom offers up the Matrix-like computer simulation as his variation of shadows on the cave wall; a simulation capable of mimicking an entire world of people, clueless as to their existence in a simulation, on some yet to be invented computer system 50 years or so into our future. As usual this theory has a few holes in it. Let’s shine a little light through them, eh? To start with, the simulation would not only have to include every person, but every visible bit of matter in the sky; essentially you would have to simulate the entire universe. Why, you might ask? It’s quite simple. For the simulation to be flawless, undetectable to the sim or sims residing in it, you would have to plan for every eventuality. Space based telescopes to view distant objects in the universe, for example. Or perhaps electron microscopes for examining the atom, at the other end of the spectrum. True, you could falsify the data for individual sims, but what would be the purpose of creating a sim that interacts with no one and exists only to be lied to about what is real? The satisfaction of deceiving your own creation? A serious investment of time to no real purpose. No, the purpose of running simulations (even in games like The Sims and Simcity) is to discover the results of complex interactions between sims and the effects of external stimuli; in other words, you would need to have several autonomous sims interacting in a world that would be indistinguishable from the real world, which places you squarely back at simulating the entire universe. Yes, it might be possible some day to create such a complex simulation; but ask yourself, what purpose would it serve to simulate the entire universe? Better to program your sims not to question what lies beyond the window, or above the sky. This would save millions (probably even billions) of terabytes of data, and would radically simplify the simulation, making it potentially possible to program the simulation within a person’s lifespan. This is the other end of the problem that never gets addressed when these sorts of suggestions come up; who or what programs these simulations, and how long it would take. I daresay the programming time to accurately simulate the entire universe down to the individual atoms would roughly equate to the amount of time it has taken the universe to evolve in the first place. All of that aside, clearly we can and do question what is outside the window, above the blue sky, what matter is made up of, etc. ; so we are obviously not in a simulation. And if we are in a simulation programmed by a post-human that simulates the entire universe; how is that post-human distinguishable from god? In other words, what Mr. Bostrom has created is an overly complex way of saying “It’s god’s will”. And it’s not much of an original thought when viewed from that perspective. Also, I think it bears pointing out that in The Cave, Plato allows one of the slaves to escape, because the allegory is an exploration of the interaction between the slave who has been free, and has a heightened understanding of what reality is, and the slaves still imprisoned in the cave. The purpose of the experiment is to explore the interaction between the different beliefs about what is real; and how easily deceived we are when it comes to the subject of belief. Even in the original allegory of the cave, no accommodation is made for the feeding and care of the slaves, or how this care takes place without the slaves becoming wise to the freedom of those who care for them; which would raise questions about the nature of the reality they were confined to. Again, curiosity and exploration would lead to questions that reveal the lie of the shadows; just as the Matrix is revealed to be nothing more than a sham to those willing to question it’s reality. An allegory should not be taken literally. Plato’s cave questions the reliability of our natural senses, wondering what is hidden behind the limited visible spectrum; a question science has answered to a large extent today. The Matrix questions social interactions of the modern age, hypothesizing that there is a greater force than we realize at work behind the scenes. That the film goes on to literally find us plugged in to a simulation controlled by machines from which there is no escape is not the purpose behind the question. The purpose, in my interpretation, is for us to question what does govern our social interactions; what is the meaning of the endless wars, why is there a driving need to consume? Why should we lead meaningless, faceless lives that we do not believe in? Isn’t it better to throw off the chains and face the unknown, than to stare placidly at the cave wall and accept the musings of the equally clueless slave next to you? My answer is obviously “yes, face the unknown”; I can’t speak for you, and your mileage may vary. Author ranthonysteelePosted on August 30, 2007 Categories Film, Games, Philosophy, Religion, Science, TechnicalTags Faction2 Comments on The Cave… Again; or, God is a couchpotato geek. Maybe it was something in the water? I’ve been a big proponent of the new OS over the past few months, even going so far as loading it onto most of my computers and spending hours tweaking and optimizing it. So why, nine months after launch, am I so frustrated? The litany of what doesn’t work and what still frustrates me stretches on endlessly. As someone observed in the comments section on digg, PC magazine has been bought and paid for by MicroSoft for quite some time now. For the editor to retire while publishing a scathing critisism of Vista speaks volumes. I’m glad Rankin took the time to write down his reasons for not buying an iPhone. I’ve been thinking I needed to do this, and it saves me the time. Frankly, I don’t know what the buzz is about. I’ve been carrying a Palm device for more than 5 years now. My first device was a Handspring Visor (still have it) and it had expansion cards for cell phones and mp3 players (still have those too) it predates the iPod, and cost half what the iPod does. My current device is a Treo 650, and it does everything the iPhone does for about half the price as well. Go figure. Vista Hits Store Shelves. So What? Stumbled across this article over at digg.com, discussing the departure of Windows chief Jim Allchin, and breathless praise concerning the latest version of Windows to hit store shelves, Vista. My response? Goodbye Jim Allchin. The rest of the article is a puff piece designed to spin the Vista delay in the correct direction, rather than discussing the real reasons for same. Reasons like the failure of Vista’s predecessor, Longhorn; failed because nobody wanted the invasive security measures that were touted as one of Longhorn’s strengths (the chipset it was to utilize was shelved, if I remember correctly, over the same issues) It’s taken nearly five years to design and build a version of Windows that Microsoft thought people would go for, that also included enough of the DRM and anti-piracy measures (that corporate America is inexplicably in love with) to satisfy Microsoft’s business partners and it’s legal department. Good luck with it. It’ll never see the inside of any of my systems, at least not in it’s unadulterated form. I’m not the only one who feels this way. Apparently the opinion is pretty widespread, and not exactly earth shattering. Of what use is an operating system that disables programs and media that it can’t verify are legally purchased (can’t verify as opposed to aren’t legally purchased, an important distinction) one that is hostile to other DRM schemes, schemes that are just as valid as it’s own (the issue with i-Tunes has been well documented, albeit patched) An operating system that requires every user to create a Windows Live account in order to validate the installation; a completely pointless requirement, except that MicroShaft is deluding itself into believing that it can compete with Yahoo and Google, and so think that forcing new users to register in the system will lead them to actually use the system. Time to get serious about Linux. Author ranthonysteelePosted on January 29, 2007 Categories TechnicalTags Linux, Microsoft, Piracy, SoftwareLeave a comment on Vista Hits Store Shelves. So What? If I had a nickel for every free marketeer that waxed poetic about the greatness of Microsoft and how we owed Bill Gates thanks for the computer boom, I could probably challenge big brother Bill for the title of richest man in the world. But I don’t buy the scenario. Microsoft doesn’t hold monopoly marketshare because they have a superior product. Microsoft wins because it is supplied on a PC system at no significant charge. It’s a lot like payroll deductions. Most people don’t notice the difference between net income and gross income. They don’t do their own taxes, balance a checkbook, etc. That’s why they support things like socialized medicine; it will be free to them because they don’t count the costs that come out of their pocket before they even know what they had. There isn’t a cost to them at point of purchase, so they think of it as free. When you buy a computer system, there is a lump sum fee that you pay. There is no detailed record of what everything that goes into your computer costs. There is a software upchage of about a hundred bucks on the average windows system. I can buy a complete computer system with a Linux OS on it for 150 to 200 bucks. Windows systems are generally much higher than that. If people had to pay for the software upfront, this would all be a different story. Microsoft would not have the marketshare they currently have. The MPAA and the RIAA would not have been able to advance their agendas because there would be no monolithic software giant to enforce their will. There wouldn’t be the problem that currently exists with viruses and malware, because there wouldn’t be a Swiss cheese OS out there that is specifically set up to be hijacked. It is the massive market share (and sweet deals for exclusivity with Microsoft) that has gotten peripheral suppliers (like cameras and scanners) to program their drivers for Windows only. There was a time when driver disks had multiple OS options on them. I almost never see that anymore. It’s not the fault of Linux programmers that peripherals aren’t recognized, it is the fault of the manufacturers who don’t support anything but Windows; and will in fact build their hardware to rely on Windows (as in the case of some printers) to the exclusion of everybody else. It’s a corporate disease, much like a free-government-provided disease. Why Should You Use Firefox? Bob Rankin over at the Internet Tourbus (a subscription I’ve maintained for nearly as long as I’ve been on the ‘net. 1997, I think) is asking for feedback on whether or not Firefox is ready for prime time, and why should you use it. I’ve had quite a bit to say on the subject of Firefox over the years. A good portion of it on this blog, but I apparently have neglected to get into my main reason for using it, security. It’s hard to conceive of any program less safe to surf the Internet with than Internet Explorer. I have used Firefox / Thunderbird for more than three years. I wouldn’t use MicroSoft software to connect to anything for any reason. I only risk the operating system because I need software that isn’t available on other platforms. The security holes that MicroSoft’s propaganda arm (known as the tech reporting industry) keep harping on concerning Firefox have been patched. If you download the current version you shouldn’t have any trouble; not to mention the benefits of built-in pop-up blocking and spam filtering. As someone who remembers working with Wordperfect and Lotus 123 on 386 DOS boxes (not to mention the playing around with the original MacIntosh) I think I can say I speak from experience. Not to mention the fact that I’m married to the #1 PC repair geek in all of Austin, and so can speak from experience on the repair side of the business, concerning the far greater risk involved in running Internet Explorer rather than Firefox. We routinely install Firefox on clients systems; and when I’m doing the work as a favor for a friend (in other words, for free) I do myself a favor and delete the icons (when uninstalling isn’t possible or feasible) for MicroShaft programs which are a liability, so that they don’t re-infect themselves and waste more of my time. Why do I say this? Because half of the systems that come back for more work, when I question their owners, are re-infected because the owners went back to using Internet Exploder (the other half are because they don’t update their virus/malware scanners properly) I have never yet gotten a system back that was infected through the use of Mozilla software. These are just the facts. …If I want a toolbar for a particular purpose, it’s generally available at the addons site. There are far more addons than any one person will use, and the extents to which the browser can be modified are quite impressive. Right click customizations for searches (I use it in Thunderbird as well) as well as tool bars for many different popular destinations on the web. The most useful one, in my opinion, is ForcastFox; which is weather, right in the frame of the browser. Too cool. When I read Rankin’s call for feedback, my first response was “What, you aren’t using it?” My second response was “Why wouldn’t you use it?” Download it today, and give it a try. Author ranthonysteelePosted on November 15, 2006 Categories TechnicalTags Firefox, Linux, Malware, Open Source, SoftwareLeave a comment on Why Should You Use Firefox? So I’m helping The Wife tonight. She’s trying to get some customer’s computer systems out the door. One of the systems is being extra problematic; an archaic old system that is older than The Son (he’s 8) running Windows 98 (not even SE) IE 4.0; and, no lie, a flat panel monitor. Microsoft is no help, you can’t even get on their site with IE 4.0 these days. you, and php should run without the error. Having nothing else to loose, we installed the Dcom update and were finally sucessfull running Firefox 2.0; which allowed us to access the Windows update site and install the remainder of the Win98 patches, including IE 6. Problem solved, out the door it goes. Never mind the system is worth less than the time we spent fixing it. Ah, the sweet taste of victory. The group, calling itself the Zeroday Emergency Response Team, or ZERT, created the patch so Windows users can protect their PCs while Microsoft works on an official update. People have a choice of third-party fixes. Security company Determina on Friday released a patch it authored for the same flaw. Personally, I find this completely unacceptable. I also find it to be the norm when dealing with large corporations and their worthless products. Microsoft plans to issue a fix for the problem on Oct. 10, its regularly scheduled patch day; pretty much meets the description of “a day late and a dollar short”.